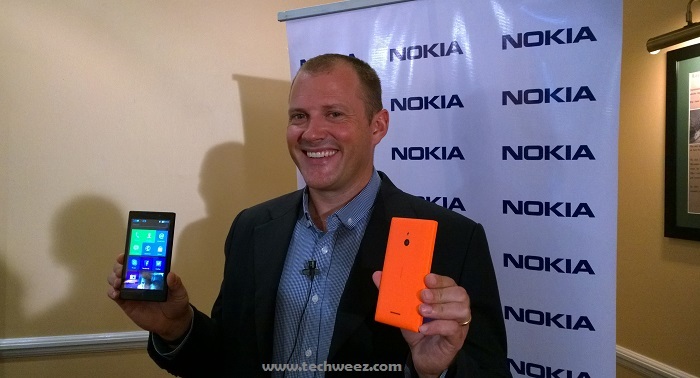 Microsoft devices has today introduced the Nokia XL to the Kenya market. The device was introduced sometime earlier this year at Mobile World Congress in a bid to address the consumers who prefer the Android ecosystem with all it’s versatility. Now the Nokia XL was one of the three Android devices launched that day, the others are the Nokia X and Nokia X+. The latter two are the lesser siblings. Kenya is a very interesting market and Microsoft Devices wants to position itself as the vendor that got all the devices that consumers want. Microsoft Devices East Africa General Manager Bruce Howe reckons that industry trends have it that 5 inch devices tend to be the central point for demand with users considering them for their productivity. “Nokia X at 5 inches stands out well at it’s price point and with much more productivity being done on 5 inch smartphones, we are seeing consumers prefer 5 inch devices that deliver an equal experience at productivity with larger devices like 6 inches,” Bruce noted. At launch, the Nokia XL is already available in the market and will sell in 6 colours; black, white, yellow, green, orange and cyan. Nokia XL will also come pre-loaded with local apps like Newsdrift, Supersport, Jumia, Capital FM, Goal live , DStv and Kenya Airways. Currently Nokia has curated 480 best apps developed by Kenya developers on the Nokia Store. Nokia XL is already on sale at the price of Kshs 15,500 in Kenya.